In 2001 Blaze of Glory was a new departure for me, and a hugely important one as it affected ALL the modeling projects I have produced since. 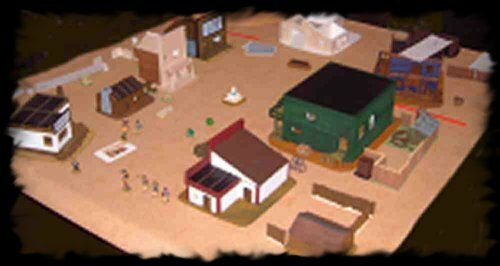 All of the scenery was designed to have figures put inside, until I started Angel Creek my models had been pretty good but had always been solid obstacles. Since Angel Creek everything I make comes apart, even the huge Victorian and Tudor mansions and manor houses. I started with the Sheriff's office, just to see if the whole thing was possible. Then it just grew from there. Each building came apart to allow access. In some cases the various floors come off as well as the roof. The interior of each building was partially detailed, counters and bars etc, but clear enough to get several figures in practically, and a players hand. One of the best things about Western buildings is the tar & paper roofs, which revolutionised my building making, it's no where near as painstaking as tiling a roof. Some of the buildings were inspired by Gary Chalk's article in Wargames Illustrated Magazine (Issue 160) Some from an earlier WI article in Issue 135. But most inspiration came from watching various modern Westerns: The Quick & the Dead, Unforgiven, Young Guns to name but a few. The first buildings I made were all heavily inspired by Crystal River in the film Maverick. A great set which really gives the impression as to how ramshackle these settlements originally were.